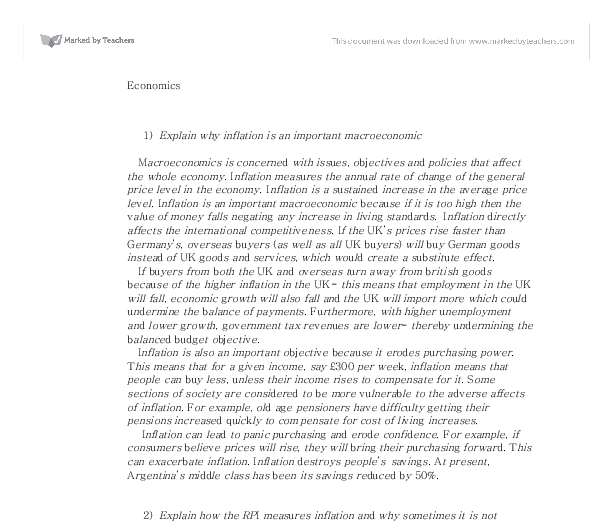 Economics 1) Explain why inflation is an important macroeconomic Macroeconomics is concerned with issues, objectives and policies that affect the whole economy. 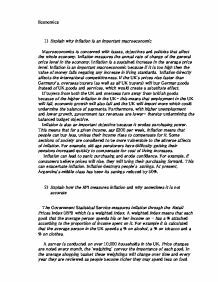 Inflation measures the annual rate of change of the general price level in the economy. Inflation is a sustained increase in the average price level. Inflation is an important macroeconomic because if it is too high then the value of money falls negating any increase in living standards. Inflation directly affects the international competitiveness. If the UK's prices rise faster than Germany's, overseas buyers (as well as all UK buyers) will buy German goods instead of UK goods and services, which would create a substitute effect. ...read more. Inflation is also an important objective because it erodes purchasing power. This means that for a given income, say �300 per week, inflation means that people can buy less, unless their income rises to compensate for it. Some sections of society are considered to be more vulnerable to the adverse affects of inflation. For example, old age pensioners have difficulty getting their pensions increased quickly to compensate for cost of living increases. Inflation can lead to panic purchasing and erode confidence. For example, if consumers believe prices will rise, they will bring their purchasing forward. This can exacerbate inflation. ...read more. A survey is conducted on over 10,000 households in the UK. Price changes are noted every month, the 'weighting' convey the importance of each good. In the average shopping basket these weightings will change over time and every year they are reviewed as people become richer they may spend less on food and more on leisure. Also new goods and services come on the scene. For example, home computers in the last 10 years or the increased expenditure on cosmetic surgery in the last 5 years. Like any survey, the RPI might not be representative of actual expenditure patterns in the economy. The RPI is an average for the entire UK, it will not necessarily reflect accurately the situation regions in the UK. ...read more. Another way for the government to 'manipulate' the balance of payments is via import controls. However, this is often discouraged in the international community, nevertheless despite the efforts such as the World Trade Organisation, import controls have remained a powerful weapon to governments. To control the common diseases and to alleviate their pain and suffering, various health programmes like TB, Malaria and AIDS Control Programmes were also carried out. POPULATION & LABOUR FORCE AND EMPLOYMENT: Pakistan's population in mid-2004 is estimated at 148.72 million - 1.9 percent higher than last year. As the rate of inflation is now permanent at this 5% and has caused unemployment to increase, the economy is now at point B on the PC2 curve. If the government decides to try to reduce the level of unemployment below the natural rate of unemployment by reducing aggregate demand, output increases and unemployment falls. because of this the MPC tries to react to changes after they have happened which causes the time lag effect. The same pattern is shown before and after the MPC took over control of interest rates, but the major difference is the change in levels of interest rates have been less than those exhibited before they took charge. This country is also a leader in the shipping business especially in the car manufacturers. It includes BMW, DaimlerChrysler (Mercedes), Opel which is owned by GM, Porsche and Volkswagen AG including Audi. Finally, Germany's service sector has grown steadily in recent years and now contributes the largest share of GDP. Secondly, import controls could be used. These were physical controls on the number of imports allowed into the country, or taxes (tariffs) on imports, causing prices to rise. Both types of control reduced the amount of imports bought in the UK. Investment, which is also an injection. Investment normally falls dramatically during a recession as prospects for the future of the economy are bleak, which is a common cause of a slump as a lack of investment leads to a lack of efficiency.